Fashionistas, assemble: the V&A Museum’s spring/summer blockbuster, Christian Dior: Designer of Dreams is now on (and it’s predictably fabulous). Fashion visionary. Anglophile. Dog lover. Brand builder. Avid reader of gardening catalogues. 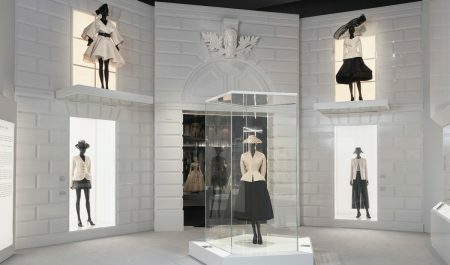 There were many sides to legendary French couturier Christian Dior, and the V&A’s latest blockbuster fashion exhibition sets out to illuminate at least some of them through a collection of more than 500 items, including 200-plus stunning couture garments as well as photos, sketches, vintage perfume bottles and personal mementos. As we discover in the first, and most biographical, room of the show, Dior’s well-heeled parents were sometimes disappointed that their second son didn’t end up becoming a diplomat. But another fate lay in store for the artistic boy from Normandy who once sold sketches to earn pocket money; nothing short of reinvigorating the post-war French fashion industry. 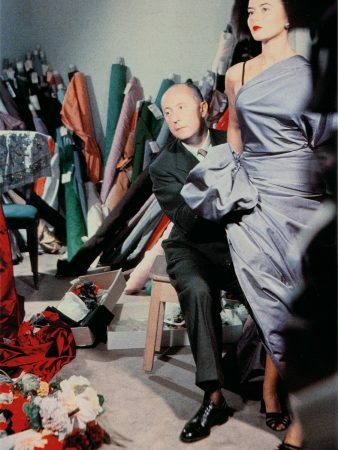 After an early, abortive stint as a gallery owner, Dior learned his trade as a designer at other couture houses before launching his own collection in 1947. Combining precise, sculptural tailoring with exaggeratedly feminine shapes, it caused an immediate sensation. One of the stars of the show (then as now) was the 1947 ‘Bar’ suit – the wasp-waisted, full-skirted silhouette that was dubbed the New Look of the age by the editor-in-chief of Harper’s Bazaar, a tag that stuck. The V&A acquired the suit back in 1960, and it has pride of place here at the beginning of the main fashion displays. 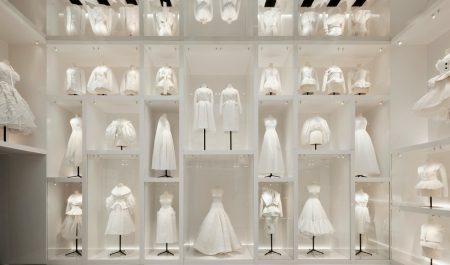 Arranged thematically, these encourage visitors to trace style continuities through the House of Dior’s seven decades of history, including a number of looks straight off the most recent catwalks. Part of the fun of the show lies in testing your fashionista credentials by guessing (without looking at the captions) from which era a particular gown dates and which designer was responsible for it. 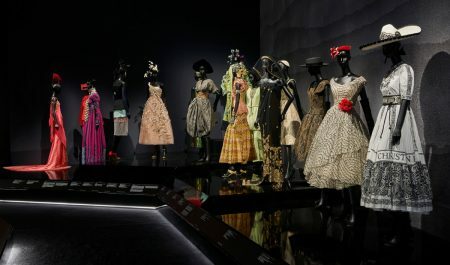 As well as Dior himself, all six artistic directors who followed in his footsteps are represented here. From the campy, theatrical grandeur of Belle Époque-inspired pieces in the ‘Historicism’ section, to ‘The Ballroom’ of fairy-tale eveningwear, displayed under ever-changing light projections of Blenheim Palace and the starry sky, the exhibition is, as you’d expect, impossibly glamorous and exquisitely presented. Fittingly for a fashion house that has always adored florals (Dior took the names of two of his early looks from the gardening catalogues he loved to pore over), there is also a room devoted to some of its loveliest garden-inspired confections. Here, a blossomy dress by current artistic director Maria Grazia Chiuri, embellished all over with delicate, petal-like dyed feathers, takes centre stage under a Instagram-friendly ceiling of cut-out paper flowers. The House of Dior always flirted with global influences – its debt to Mexican, Egyptian, Indian, Japanese and Chinese design is showcased in the eclectic ‘Travels’ section (it being 2019, there is also a tactful note acknowledging sensitivities around cultural appropriation). But not surprisingly, it is Christian Dior’s love affair with the UK that the V&A chooses to foreground in its London exhibition. The sequin- and mother-of-pearl-encrusted ballgown he created for Princess Margaret’s 21st birthday is prominently displayed in an early room devoted to Dior’s links with Britain. These were considerable, with Dior claiming not only to love English traditions, politeness and architecture, but ‘even… English cooking’! The show also lays bare the meticulous atelier work that goes into every Dior garment, with a room packed from floor to ceiling with the toiles, or rough cotton prototypes, of finished pieces. 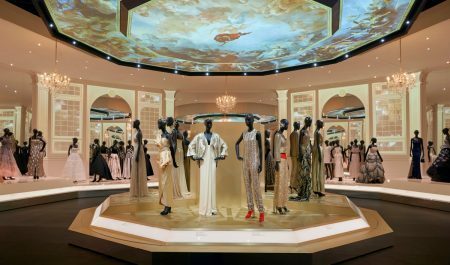 The founder of all this fabulousness is rather less exposed – the exhibition focuses on the history of Dior the House, not just Dior the man. However, there are some intriguing glimpses of the latter among the more personal objects on display, such as the five-pointed metal star, fallen from a carriage wheel, which the ever-superstitious designer picked up on a Paris street and kept forever afterwards as his lucky charm. Another telling piece is the grandiose, limited-edition perfume bottle, modelled on Dior’s beloved dog Bobby, which was presented to only the most treasured customers. A business-savvy seller of accessories and brand extensions, scent was always part of Dior’s vision for the House. He launched Miss Dior in tribute to his younger sister Catherine, a French Resistance veteran who was captured by the Gestapo and survived a Nazi concentration camp. Understandably, this show focuses on the ups, rather than the downs, of building and maintaining a fashion empire. John Galliano’s forced departure as artistic director in 2011, after a drunken public outburst that saw him found guilty of racist and anti-Semitic abuse, is alluded to only in the briefest mention of controversy. Here, all the drama is strictly sartorial in nature – but what drama! From those iconic 40s and 50s looks to more recent stunners such as the golden dresses donned by Charlize Theron for the J’Adore perfume campaign, as well as many celebrity red-carpet looks, as everyone from Elizabeth Taylor to Lupita Nyong’o has stepped out in the brand. The exhibition ends neatly with one last knockout gown from Chiuri that pays loving homage to a Christian Dior fan from the archives. As you emerge, dazzled by sequins, crystals and glitz, the real world feels all too drab by comparison. In a word, dreamy. 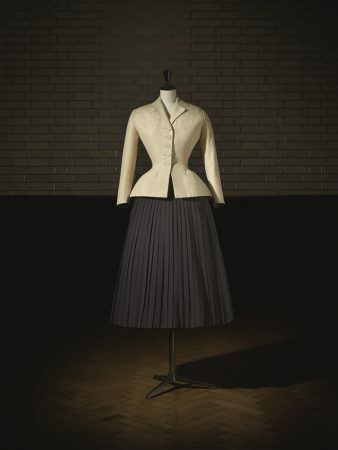 Christian Dior: Designer of Dreams runs from 2 February until 14 July 2019 at the V&A Museum, South Kensington, London.